Father Chip Seadale leads orientation session. As people gathered Wednesday evening at the Good Shepherd Parish Center in Oak Bluffs, Father Vincent (Chip) Seadale was getting some good-natured ribbing from his friends and colleagues. 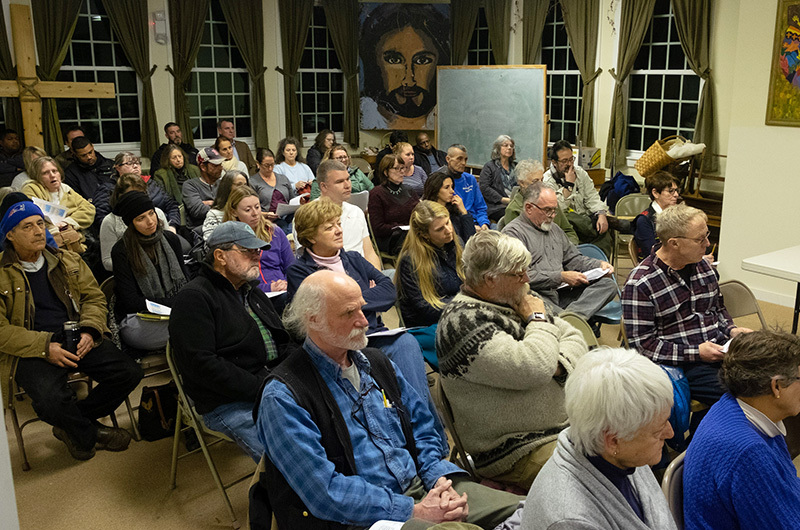 They were there for a volunteer orientation session for those interested in helping to staff Houses of Grace, a system of winter homeless shelters organized at three churches by Island clergy. 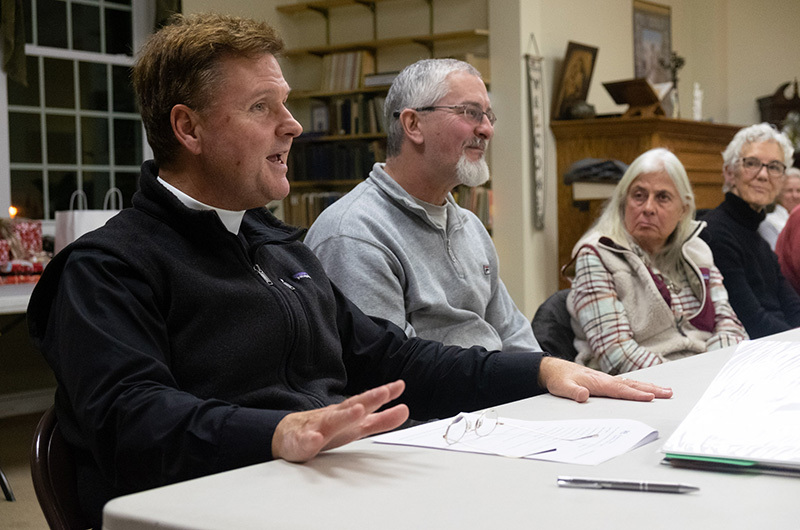 Father Seadale was nervous that only a few people would show up, which would signal problems in filling the nearly 360 volunteer shifts it takes to operate the shelters seven days a week from Jan. 1 to March 31. His friends were needling him about his lack of faith. But then the organizers had to set up a few more chairs as interested volunteers continued to come in from a cold, crisp night. Then they had to set up a few more chairs, as more people came in. Then they had to move the head tables back, in order to squeeze in more chairs. By the time the orientation session began, the parish hall was packed with approximately 70 people who wanted to help. The shelters are open at three different churches throughout the week, beginning Jan. 1. On Mondays and Thursdays, the Federated Church in Edgartown hosts the shelter program. On Tuesday, Friday, Saturday and Sunday guests can stay at the St. Andrew’s Parish House in Edgartown. On Wednesday this year, the overnight shelter will be hosted at the Good Shepherd Parish Center in Oak Bluffs. The church facilities are open to men, women and families who need a place to stay. Guests have to check in by 8 p.m. and leave by 7 a.m. the next morning. Several would-be volunteers had questions about safety, and how to handle the occasional unruly guest. Program coordinators said those situations are extremely rare, and police are always ready to step in and help, but that usually a little common sense and understanding solve what few problems crop up. Dorie Godfrey, who helps coordinate volunteer shifts, said the people who use the shelters are grateful for the program, the hot meal, and even a sense of camaraderie that develops. Ann Bassett has never volunteered for the program before, but she came Wednesday evening to get the training and offer her help.